Zigi Zagi Finland is as a business to business company marketing and selling highly innovative office supplies and corporate image products as well as more traditional products needed in the office environment. Our sphere of operations also include importation. We provide high quality products and services for users who desire the best. Solutions are made together with the client to help us bond long-lasting customer relations. 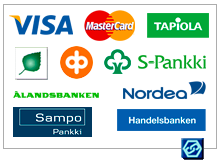 Administration and warehouse are located in Kello, but our functional domain is whole Finland. We attempt to operate locally, to fulfill the customers needs, that varies around the country. Therefore the customer always gets the products and services that are needed.